Palaeoloithic, Mesolithic, Neolithic Periods: Archaeologists have given lengthy names for the time that we are studying. They call the earliest period the Palaeolithic. 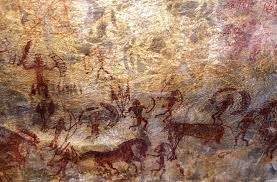 Palaeolithic comes from two Greek words, ‘palaeo’, meaning old, and ‘lithos’, meaning stone. The name points to the importance of finds of stone tools. The Palaeolithic period extends from 2 million years ago to about 12,000 years ago. This long stretch of time is divided into the Lower, Middle and Upper Palaeolithic. This long span of time covers 99% of human history. Our earlier human ancestors were hunter gatherers who led a nomadic existence using temporary camps or shelters. The main evidence of their activity is the stone tools they used and which can be picked up on the surface of the soil. Mesolithic: Mesolithic means 'Middle Stone Age'. The Mesolithic period is a period of transition from the way people were living during the Palaeolithic period as hunter-gatherers to the development of farming in the Neolithic period. The period when we find environmental changes, beginning about 12,000 years ago till about 10,000 years ago is called the Mesolithic (middle stone). Stone tools found during this period are generally tiny, and are called microliths. Microliths were probably stuck on to handles of bone or wood to make tools such as saws and sickles. At the same time, older varieties of tools continued to be in use. Look at the illustration on page13. Do you notice any difference in the tools belonging to these periods? Neolithic: The next stage, from about 10,000 years ago, is known as the Neolithic. Neolithic period in the AONB begins with the first farmers and the introduction of domesticated animals and plants e.g. sheep and wheat. Very often, we use presentday names of the places where people lived in the past, because we do not know what they called them.